I made the watercoloured background with just a few sprinkles of Brushos sprayed with water on mixed media paper. I used some beautiful turquoise foil that I glued onto card stock (to give it some strength) and die-cut the leafy sprig. I tucked the bottom of the stems in behind my frame and brought the leaves forward so they would sit outside the frame. 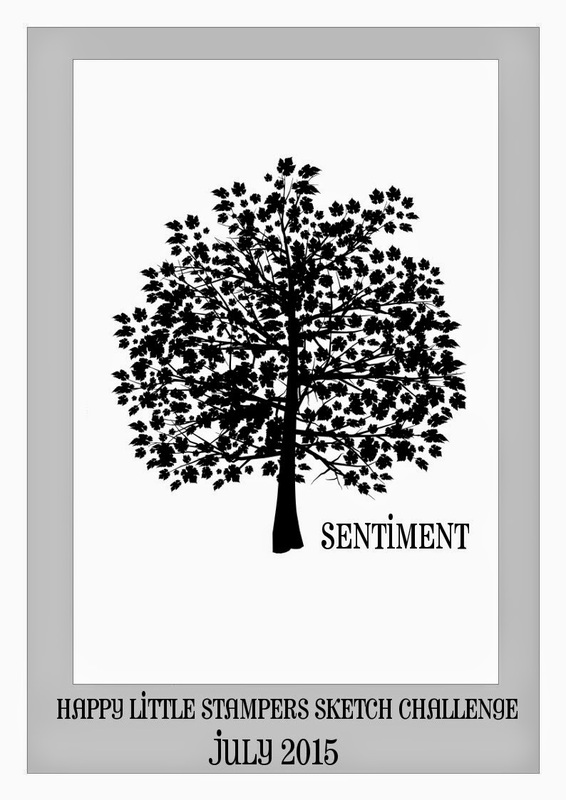 A simple stamped sentiment in soft gray doesn't take away from the main panel. 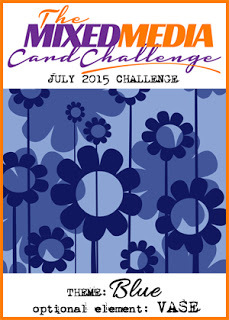 Today I'm playing along with the Mixed Media Card Challenge where the July challenge is Blue. Thanks for coming by. I appreciate your visit!! Labels: birthday, Brushos, CAS, CAS mixed media, memory box, metal, spellbinders, Stampin' Up! Your card is simply elegant, Loll! You have inspired me to take out my Brushos and play with them again. I love the foiled leaves...adds a nice, dazzling touch. Bonnie will love this! I certainly do! Great card for the Mixed Media challenge. Beautiful card! The elements are stunning in blue. I love the color blue. This card goes to my heart. I adore her! Gorgeous card! Love the foil. Beautiful birthday card for Bonnie! That delicate card was so wonderfully made, I nearly teared up. Gorgeous, simply gorgeous. So clean and simple yet elegant. I always love your creations, but had to come over and leave a comment for this one! Loll, This is stunning!! I love the turquoise foil look! Elegant but not overpowering. I went to the Add a little Dazzle site and did a search but did not come up with anything. Is there a slightly different name for that? I will check back here, so don't feel you have to answer me in 2 places (as you have been so kind to do in the past). Thanks! Loll, your card is amazing! 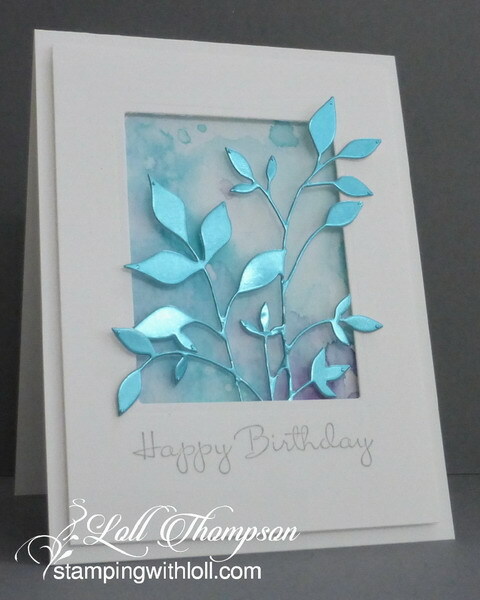 Love those metallic leaves in combination with your water colored background - it makes for a stunning contrast! Oh wow Loll! You never fail to inspire me and this is just gorgeous. Really gorgeous birthday card, Loll! I love the turquoise leaf sprigs with your water colored background...so soft and pretty! I'm sure Bonnie will cherish all the love you put into it! Loll, such a beautiful card. Love your colours, layout everything. Absolutely perfect. You really did a subtle background with your Brushos, Loll. I haven't seen one quite like it. The foil leaves are gorgeous and I see by the comment that Bonnie loved it. I'm not surprised. This is gorgeous! I especially love those turquoise foil leaves. Very unusual and totally bewitching. Just beautiful Loll. That shimmer is wonderful. This card is so beautiful loll! I love the paper color!! !